My old RX for EME with dual pol system on 2m. I used a “Stereo” rx system listening to signals when I worked EME. This means I had 2 separate RX lines all the way using common LOs. How to do this? Here is a small description of my setup. The FT1000MP is moded with the external BPF-1, band pass filter unit. In the older FT1000D the optional BPF filter can be installed internally. Further mods I have in my FT1000MP: 70MHz IF-mod from Inrad and vfo-tracking, by pressing a switch I have the sub rx vfo running as a slave to the main rx vfo. That´s it! 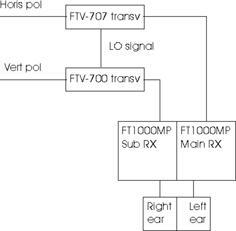 RX operation is very simple, I just tune the band with the main VFO. The human brain mixes the H and V pol so I get all polarisations. According to some people I lost 1dB by listening like this instead of the best pol in both ears. But I felt comfortable with it. It gave me a minimum of relays and stuff that always malfunctions when trying to work the rare ones! I used the Collins mechanical 500Hz cw filter in both RXs on the FT1000MP. Either external DSPs (two required!) or homebrewed audio filters of some sort or a dsp software that runs stereo RX would be useful. When moding the FT1000MP the op of the rig handles like this: when switching off the external BPF unit it runs exact as a original FT1000MP. When activating the BPF unit I got 2 diff antenna jacks for each antenna. The rx paths is identical except for one thing: the RF amp only works on the main RX. This means I get lower signal levels in the sub rx. In the following wavs I have compensated this with the balance control of the sound blaster wav recorder, not the best way to do it. In the future I will straighten this out by: adding more RX gain on 2m. Then I can switch off the rf amp in the main rx. Now I have to much IF gain in the main rx, but this is fairly simple to correct.